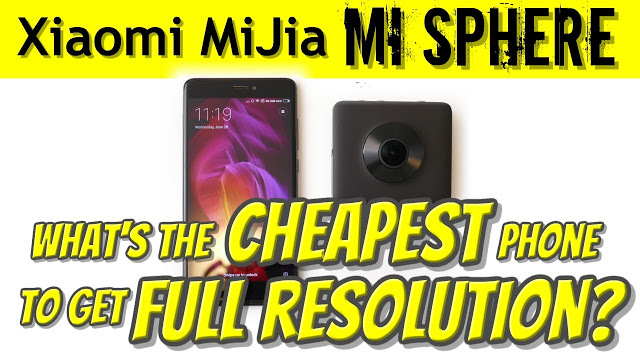 Can this $170 smartphone export Xiaomi Mijia Mi Sphere videos at full resolution? Can this $170 phone export the XIaomi Mi Sphere at full resolution? To use the best 360 camera for consumers at its full resolution, you need the right phone. What’s the cheapest phone that can get full resolution from the Xiaomi Mijia Mi Sphere? The Xiaomi Mijia Mi Sphere 360 camera (reviewed here) has the best photo AND best video quality I’ve found for under $700 as of June 2017, besting popular cameras such as the 2017 Samsung Gear 360 or even last year’s 360 video shootout winner, the Kodak SP360 4K Dual Pro. The only camera I have that has more detailed video is the $799 Garmin Virb 360. However, the Xiaomi’s app can only export videos at full resolution with the right processor, which sadly excludes all iPhones (even the iPhone 7 Plus) or phones such as the Samsung S6. But because the Xiaomi is so good for photo and video, it may actually reasonable to buy a phone just to be able to use the Xiaomi at its full resolution. I’m not saying to replace your existing phone, but to get a second one just to stitch the Xiaomi. But what is the cheapest phone that can get the job done and export at full resolution? Can an inexpensive smartphone stitch and export Xiaomi Mijia Mi Sphere videos at full resolution? I’m talking about the $170 Xiaomi Redmi Note 4. So the answer is YES, the Xiaomi Redmi Note 4 can stitch and export Mi Sphere photos and videos at full resolution. Redmi Note 4 is available on sale for $170 (in fact there is currently a flash sale for $150). Strangely, only the gray and gold versions are on sale. The black version (which I used in the demo) has no flash sale. For full disclosure, Xiaomi engineers said they are working on a desktop app which hopefully adds full resolution stitching across a variety of PC hardware. However, having a phone that can stitch videos can enable you to stitch videos while you are on the road away from your PC, or indeed, it can stitch your videos as you drive home. It also helps that the Redmi Note 4 has a Micro SD card slot, which allows you to expand its memory affordably. The memory can be used to store 360 videos, which take up a lot of space. (Note: however, you can only stitch from internal memory. The exported video could then be moved to the Micro SD card after it is stitched. Thank you very much for using the affiliate links above to support 360 Rumors at no additional cost to you so we can do more tests and reviews! Did they say if a MAC desktop app was coming? They didn’t say. I suggest making your concern known in the Xiaomi Mi Sphere Facebook group. facebook.com/groups/mijia360cam There are Xiaomi engineers who are active in that group. What’s special about the redmi? Would t any android phone with a 625 or better work? Thanks! So my axon 7 should work fine? For the redmi 4x – does it matter if it’s the 3gb snapdragon 625 or the 4gb octavies version? Your link is to the 3gb. I bought the Xiaomi Redmi Notes 4 after reading your article. it is not true that xiaomi mijia 360 exports to full resolution with that smartphone !!! the maximum I got was 1920 x 960 !!! f … uk you !!!! How do I find out if my phone is, in fact, exporting at full resolution? Also, I have an Asus Zenphone 4 and I am not sure if it actually handles at full resolution. Is the Xiaomi Redmi Note 4 4G Phablet the only phone that can handle the task? I ask because if I am planning on buying a phone to replace my Asus and want to get something better; I don’t mind expanding my budget to accommodate something better. Any suggestions for a better option for phone? Thanks for the website and youtube channel! Hi Victor. If you go to google photos and tap on information, you can see the resolution of the file . The video should be 3456 x 1728. If it’s less than that, it’s not full resolution. My samsung c9 pro is Qualcomm MSM8976 Snapdragon 653 but only stitches at 1440×720. Could you recommend another phone besides a xiaomi? Thanks. LucidCam 4K 180-degree 3D VR camera launching with 15% discount!